Korea has earned a reputation as a hard place to do business. Legal squabbling involving the U.S. buyout company Lone Star Funds has further blackened its image, most notably because prosecutors were loudly indignant over court reluctance to bend the rules. The key lesson many potential investors are taking from the case is that Koreans are proud. In Korea, wealth is not just wealth, it's national pride, it's almost religion. In the 1970s and '80s, the country rocketed from a war-devastated and poverty-stricken periphery to a central player in making Asia a sparkling new financial center to rival the old, the tarnished, the West. It was a startlingly speedy journey from rags to riches guided by the steady but steeled hand of Park Chung-hee. It was a dictatorship, but one that struck gold. 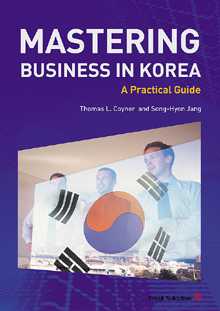 Thomas Coyner and Song-Hyong Jang detail the passage and its consequences in their how-to book "Mastering Business in Korea: A Practical Guide." They steer readers through points of history that investors should know as well as key points of culture to keep business executives from letting a chopstick poke holes in a lucrative deal. The dwell on the routines of the workplace and marketing tactics. These are the book's strengths. The authors, both consultants for foreign businesses looking to invest in Korea, have experience and authority. Their analysis delves into complexities beyond most books of this type. But the guide suffers from inadequate editing. The information would hit harder if the text was less repetitive. In one place, the same paragraph is repeated without changes three times. While the consistent small errors may annoy the reader, the book should not be discounted. It includes useful and timely information for investors from true believers. They believe and they know, and, after reading, you might too. Antagonism between N. Korea and China? A New, Post-Sunshine Policy Paradigm? The above writer, Tom Coyner, is the president of Soft Landing Korea (www.softlandingkorea.com), a consulting firm that specializes in business development largely via sales training & consulting. He is also a veteran writer and author of various books. He has been living in Korea and Japan for 25 years working for global companies.